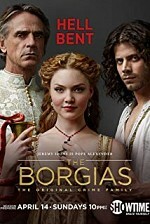 Watch The Borgias: The rise to power, and start of a dynasty, of the Borgia family. Rodrigo Borgia ascends within the Catholic Church, becoming Pope Alexander VI. The position brings with it many enemies, internal and state-based, and he has to use all of his abilities of diplomacy, ruthlessness, charm, and the power of the church to stay in power, and alive. Luckily, his children are equally ambitious. C'mooon will someone please put up the next episodes?? When do the shows come on tv?